These roses are a special group of roses for technical reasons as well as aesthetic. 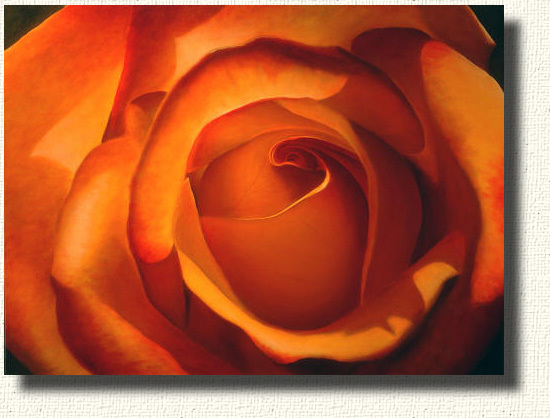 Yellow and orange roses can be quite powerful as paintings. A rose such as the Rio Samba can be passionate in its appearance as a painting. They are also more difficult to paint than most roses. The shadow area of a yellow rose is in shades of reds or brown. There are no grays and no blacks in a yellow rose painting. I put away the black pigments when I paint these roses. But the effect is to see a painting of color. 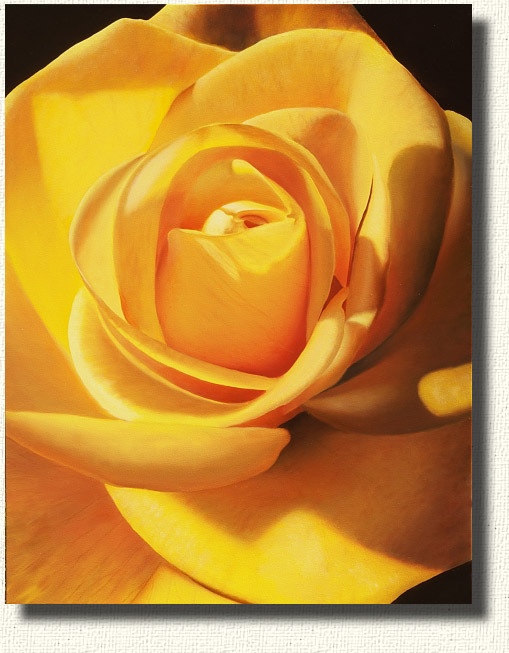 Every shade and every part of a yellow rose painting is a color related to yellow, red, or orange. This is a great pure yellow rose. It has a fine scent and does well in our garden. 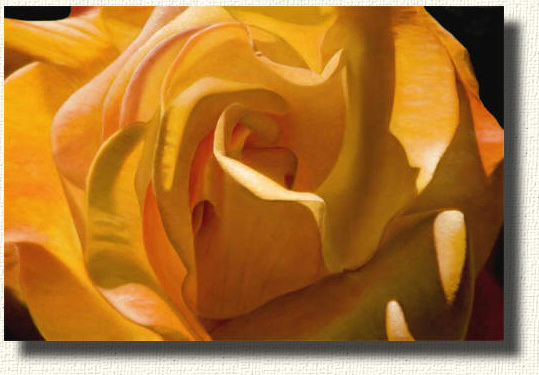 The yellow rose is a joy to paint and but difficult technically, as I have mentioned. Some shadow areas are made with a combination of violet and yellow pigments. The violet pigment cancels some of the brightness of the yellow pigment and makes what seems like a dark, muted yellow color. Yellow roses have a glow and seems to be lit from within. There is complex lighting from transmitted and reflected light. This painting is the most difficult and most technical painting I have ever experienced - but worth it! Rio Samba is a great rose. We usually have several bushes around the yard. This rose has a very tight bud in its early form but opens with flowing petals as it matures. The scent is as nice as Double Delight and the color changes during the life time of the flower from orange to pale yellow. This is a young, early season, Samba. The color is intense and the petals are smoother and less fluted. Yellow and orange roses have such beautiful light within them, both transmitted and reflected. The challenge with these roses is to be able to paint the difference between transmitted light and reflected light. In this painting the various light types are easy to see in the petal arched above the center bud. Most of the petal is directly lit from the bottom of the rose. But If you look just to the right of this petal you can see an indirect glow, some transmitted light, and reflected light all in a small area of the rose - this is the fun of these roses - in the painting of the rose and in the viewing of the painting. This is a spectacular view of this rose. We discover this rose very late in the season. It was near the end of September when this Midas bloomed to our surprise. I was able to photograph the development during that time and the color was very quiet. 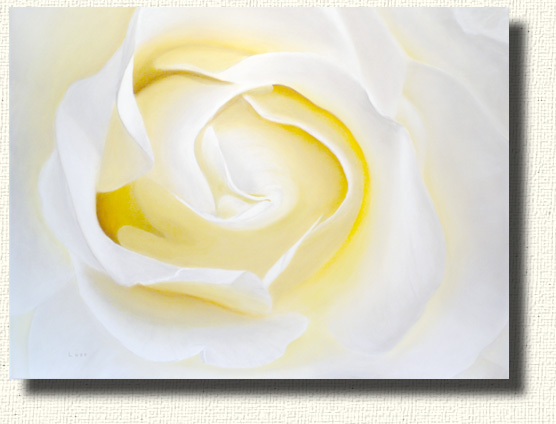 As it opened the outer petals were almost pure white with the gentle hint of yellow you see in the centert of the rose. 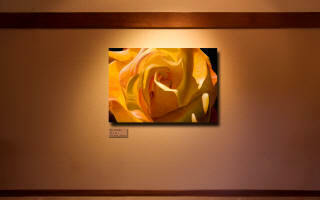 I was able to emphasize the glow of the rose heart as much as the coloring itself and this painting was the result. Midas had almost become a white rose in the Fall. But in the spring the color is an intense yellow as you see in the top painting on this page which is the same rose painted in the spring.